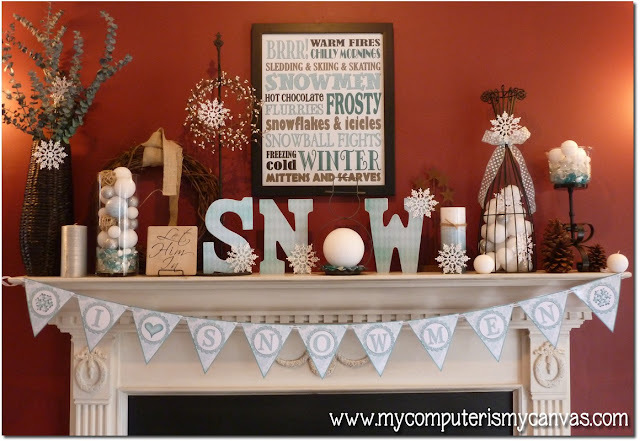 I've NEVER decorated a Winter mantle before and had tons of fun shopping and creating a full set of coordinating printables to pull it all together. I kept my color scheme with blues, browns and white... inspiration I got from simply looking outside my window. Blue skies, bare trees and snow. Aside from my 16x20 subway print (which I love) - I added some easy and inexpensive accents that really helped me pull this together without spending too much. One of my favorites is the coordinating banner. I love snowmen - they just make me happy. As I wondered the aisles at Michael's... 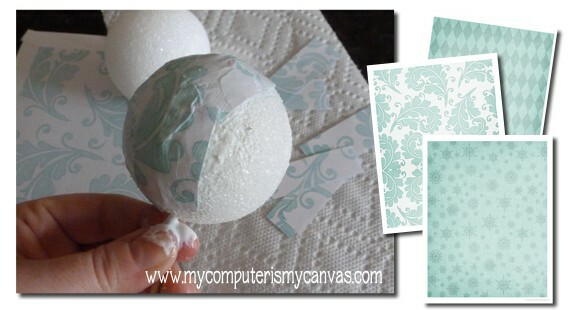 I discovered that Styrofoam balls would make a great "snowball" vase filler! To coordinate them with my print and banner, I used my "accent" papers. I just cut them into strips and ModPodged them onto a couple of the balls. I used a skewer to hold the ball while I made a gooey mess. Love it! For the word "SNOW" shown on my mantle, I just bought plain wood letters from Michael's, traced them onto one of the accent papers and ModPodged to attach. So easy and it matches perfectly! 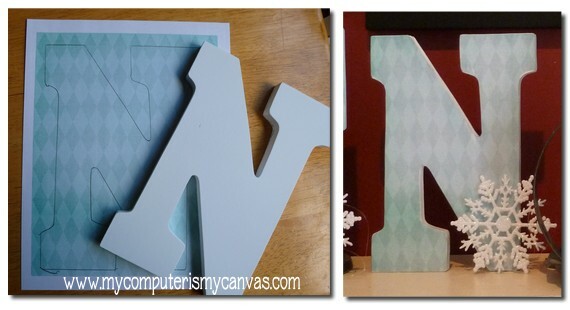 This would work with pre-made cardboard letters as well. It's just a regular Winter Wonderland around here! As always, everything is just amazing. Makes me miss the snow here in Vegas. Colette you always have the cutest mantels! I love all of your wonderful creations and how you put things together! Thank you so much for such a fun new set of printables! I love blue and brown! Great job! Your talent is amazing. Thank you so much for the printables! Thank you !!! I love these goodies !!! You always have such fun printalbes !!! So sweet !!! Thank you so much! I'm so excited to use these! You are so very talented!! oh how cute! Thank you! These are SO cute Colette! This matches my Christmas/Winter Decor perfectly! Almost everything I have is blue and snowmen (even my Christmas tree decorations!) Love these!! So excited to get printing. I just love everything you do :) thank you for these great printables! Hi Colette! I like "My Heritage Pack"
Hello again! I liked My Memories Suite's FB page and left a comment - sent by Colette. Following My Memories Suite on Twitter. Following My Memories Suite's blog. I downloaded my Valentine freebie! Thank you! I absolutely love typesetting signs! I'd put them all over my house If I could! This one is especially great, in turquoise. Saw you on tatertots and jello weekend wrap up....these are so adorable! 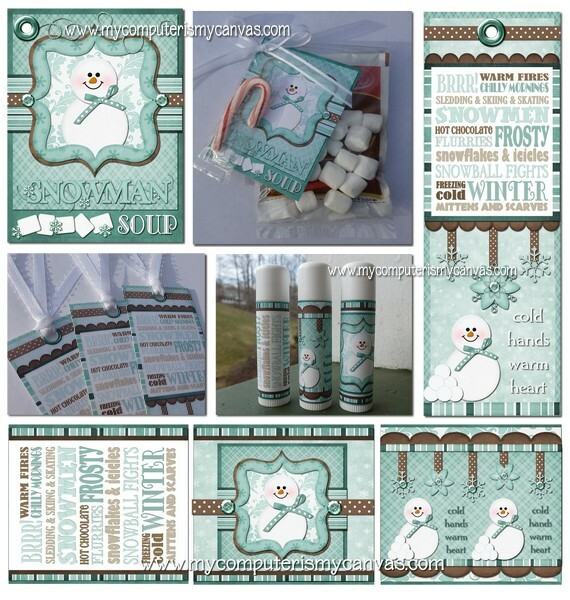 I'm hosting a Winter Wonderland link party on Monday and would love it if you linked this up!